Web forms and surveys are essential to your success. Connect 123FormBuilder to Marketo to build forms easily and send data to Marketo in real time! Sync lead data directly from a 123FormBuilder web form or survey to Marketo lists using the 123FormBuilder–Marketo integration. User contact data syncs automatically from form submissions to Marketo in real time, so all you have to do is set up the initial integration. 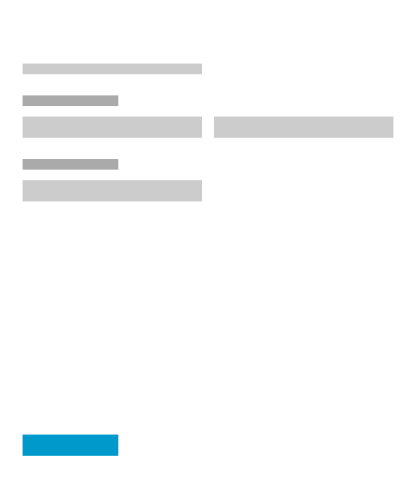 Intuitive Drag & Drop Editor Create forms and surveys with drag & drop simplicity. Select from a variety of predefined form fields and controls. Fully Branded Forms & Surveys Brand your forms and surveys with your own colors and logo. Customize as many form themes as you need. 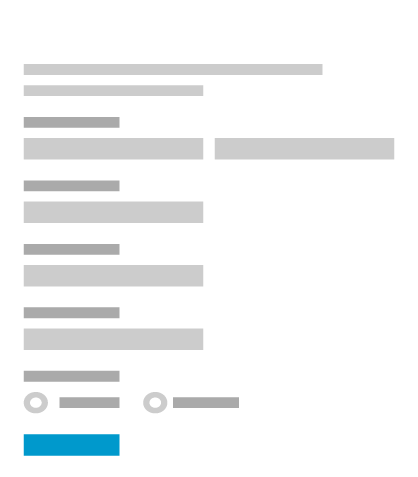 Conditional Logic Show or hide fields, send an automatic response or redirect to a specific page, depending on what users select on the form or survey. 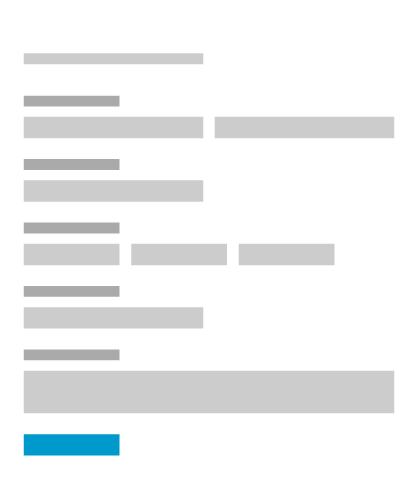 Custom Success Pages Personalize the thank-you message for your forms and surveys with text, images and videos. Multi-Language Support Translate your forms and surveys into multiple languages and personalize system messages for users. Real-time Reports and Analytics Capture and analyze data with multiple charts, graphs and filtering options. Uncover valuable insights from your surveys. The Marketo integration enables you to import leads to Marketo in real time, with every new form submission. This turns your online forms or surveys into active and automated lead collectors for your marketing campaigns, helping you stay in touch with your most important prospects effortlessly. 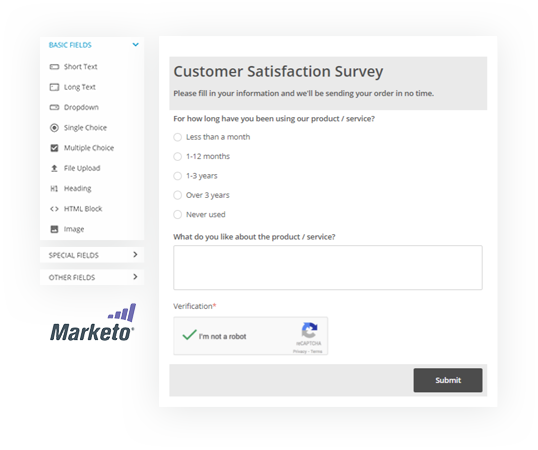 After a quick, one-time integration, visitor information from your web forms or surveys gets sent to Marketo automatically, so you don’t have to do anything else on your side. The integration will keep on helping you feed your prospect lists for further engagement. 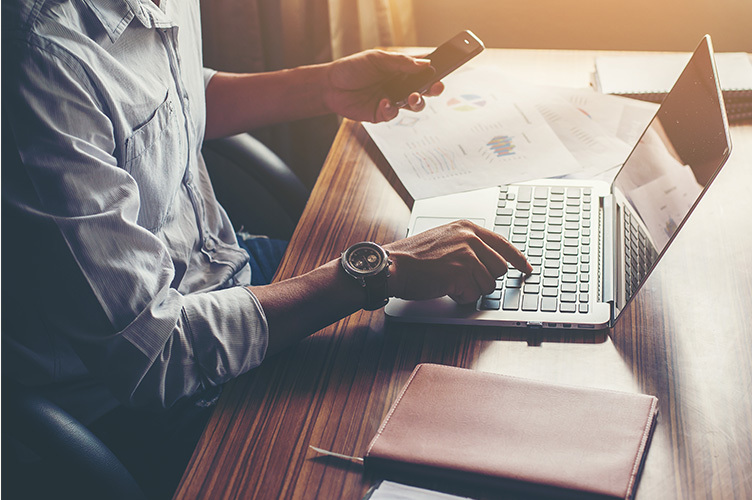 We protect your Marketo forms integration with an extra security layer against potential submission problems, such as a bad network connection on the submitter’s side, that could prevent a lead from being created in Marketo. We also enable you to create SSL secured web forms and surveys with a variety of anti-spam features. 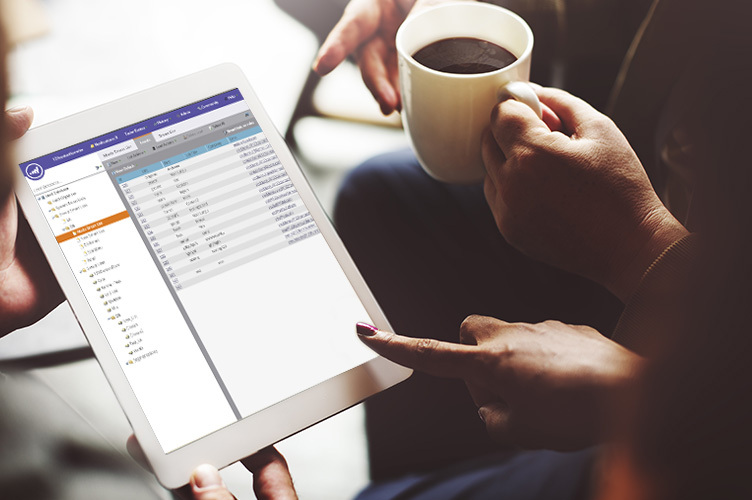 Contact data collected through Marketo forms and surveys will be at your fingertips for importing to Marketo lists, so that you can use it throughout your marketing cycle. It’s all as easy as 1-2-3! 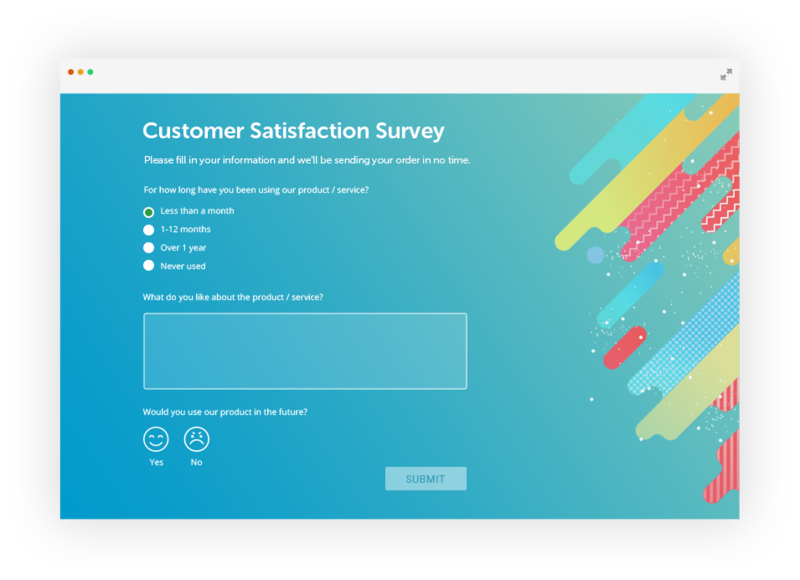 Create amazing customer satisfaction surveys with 123FormBuilder as easy as 1-2-3! No coding needed.